In my review of Ancient Shadows (AI #38), I described the music as an intriguing blend of New Age and Goth, with the kind of beats not typically heard in either of those genres, and imagined the Celtic tinged New Age of Enya and Clannad with a dark but uplifting Gothic atmosphere, along with a touch of symphonic progressive rock. The music on The Underliving is similar, though I didn’t get the sense of New Age elements this time. Maybe it’s because I’m reviewing this album a few years later and am more tuned in to Priscilla’s music. Regardless, I felt like I was drifting along in a beautifully ethereal Gothic-Celtic-Symphonic dream world. Like a Gothic Clannad crossed with a Celtic Kate Bush, built on a symphonic-orchestral Progressive rock foundation, with an atmosphere that is often hauntingly cosmic. The music flows almost seamlessly from one track to the next, making for a thematic, full album experience. The enchanting vocals are by Priscilla, who wrote all the lyrics and plays piano, keyboards, harp, flute and more; Hector Corcin plays percussion, synths, piano, and co-composed some of the music with Priscilla; Piel Fiol plays lead cello, and the rest is rounded out by various guests on backing vocals and other instrumentation. 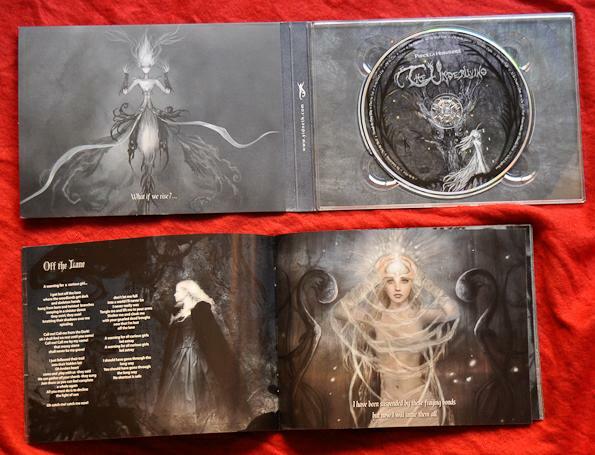 But the music is informed by so much more… The booklet that accompanied Ancient Shadows had impressed me with its beautiful examples of Priscilla’s illustrations and detailed information. But the packaging of The Underliving takes the CD medium to a level I’ve rarely seen. I’m a child of the 70s and grew up with vinyl record albums. From an aesthetic standpoint CDs are limited by their size. But The Underliving comes with a DVD case sized, 52-page book that’s jam packed with Priscilla’s stunning artwork, lyrics and information. The DVD size is just big enough that I can fully appreciate the artwork, which is very difficult with a regular sized CD booklet. I’m really inspired and fascinated when someone transcends the limitations of the CD to create something that the listener genuinely wants to hold in their hands and gaze at. It’s a much more immersive experience, like the days when I would gaze at a gatefold LP while listening to the music. The vocals, harmonies and music are mesmerizing, and following along with the book I was spellbound throughout the entire 70 minutes of the album. I can see The Underliving appealing to a varied audience. Do spend some time there. There’s LOADS of information, including a handy Shop link for purchases, but do yourself a favor and click the Fine Arts link at the top of the page where you’ll find galleries of Priscilla’s artwork. Also check out the Videos link. I found a live performance video that made my eyes nearly pop out of their sockets. The costumes, stage design and music made me think of a Celtic-fantasy sequence-symphonic-opera. STUNNING!!! Priscilla is a multi-faceted and truly gifted talent.